The double (peony) flowering blooms are extremely vibrant in colour and very showy. 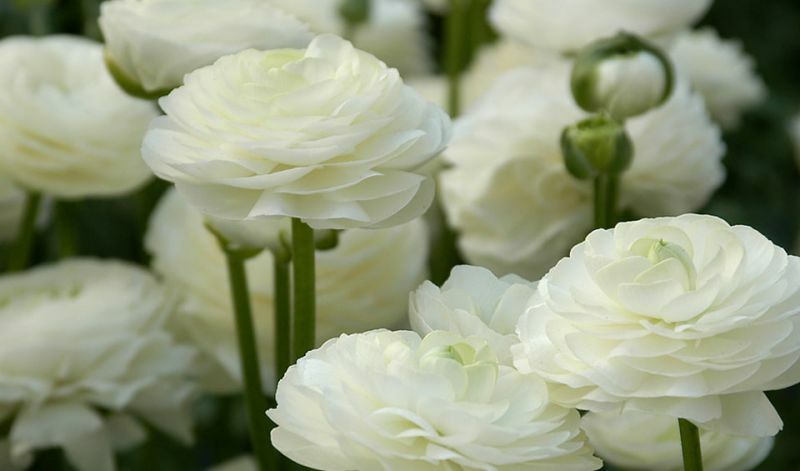 Ranunculus are very long-lasting cutflowers and make wonderful bouquets. In borders, flower beds and very suitable as cutflowers. The colors mentioned above are available in the following strains; 'Aviv' (grows 12-16" / 25-30 cm tall), 'Tecolote' (14-16" / 35-40 cm tall, with 3-6" / 7-15 cm large flowers) and 'Tomer' (10-12" / 25-30 cm tall). Native to the Eastern Mediterranean region in southwestern Asia and southwestern Europe (Crete, Karpathos and Rhodos) and northeastern Africa.